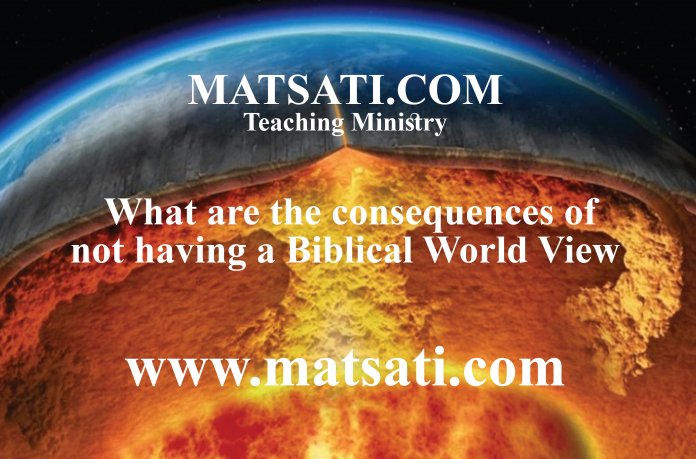 Home Science and Spirituality What are the consequences of not having a Biblical World View? A worldview is a framework from which we view reality and how we make sense of life and the world. It is very important to have an understanding of what this means and to get a handle on what a worldview is. An example to illustrate this is having a purely secular worldview leads to broken families and wasted lives, when taking into consideration how one might be used for God’s kingdom in service to Him. Barna Research Groups have conducted surveys and have concluded though most people may own a bible and know some of its content, most Americans have no idea how to integrate core biblical principles to form a unified and meaningful response to the challenges we are faced in life. The concepts found within the secular worldview does not remain in a classroom or book or being taught to small groups of people. This worldview is bombarding us through television, movies, music, news, and academia. The concepts of secular society, the ideology, appeals to the flesh, and are often incorporated into our version of reality (our worldview), often without even knowing it. This does not just effect our personal lives, these concepts are more pervasive entering into all areas of life including science. Recently For example, I have seen articles of Scientists trying to figure out where all of the earth’s water comes from. One researcher proposes the Earth’s water comes from comets and others say asteroids, and others propose the hydrogen needed to produce the water had come from a solar nebula, which is a cloud of gas and dust left over after the Sun formed. Another example from Science Magazine titled “Early accretion of water in the inner solar system from a carbonaceous chondrite–like source” (http://science.sciencemag.org/content/346/6209/623) where researchers propose the idea that interstellar water was abundant in young planetary systems of which the Earth collected as it formed to become the planet that it is today. Another article titled “Evidence for primordial water in Earth’s deep mantle” (http://science.sciencemag.org/content/350/6262/795) where researchers propose the Earth’s oceans may not be representative of Earth’s primordial water where the oceans cycled between the surface and a deeper reservoir of water, deep in the Earth. Models suggest Earth has roughly two oceans in its mantle. It is more or less a guessing game as to how the Earth obtained its water based upon the evolutionary model and time scales. The point of these studies appears to be led by the thought that life exists on other planets, where it was previously thought that the only planets that could have life on them would be in a solar system rich with water-bearing asteroids and comets. These new studies are proposing that this may not be the case, in other solar systems, not all Earth-like planets have access to asteroids loaded with water. It all comes down to the idea of the existence of extra-terrestrial life. Millions and even Billions of dollars have been spent searching out these things. This is similar to the original conclusions about the secular worldview, much time and money has been spent and wasted, not just the time and money, but lives as well. These are the consequences of having the wrong worldview. The Idols We place in Our Hearts.